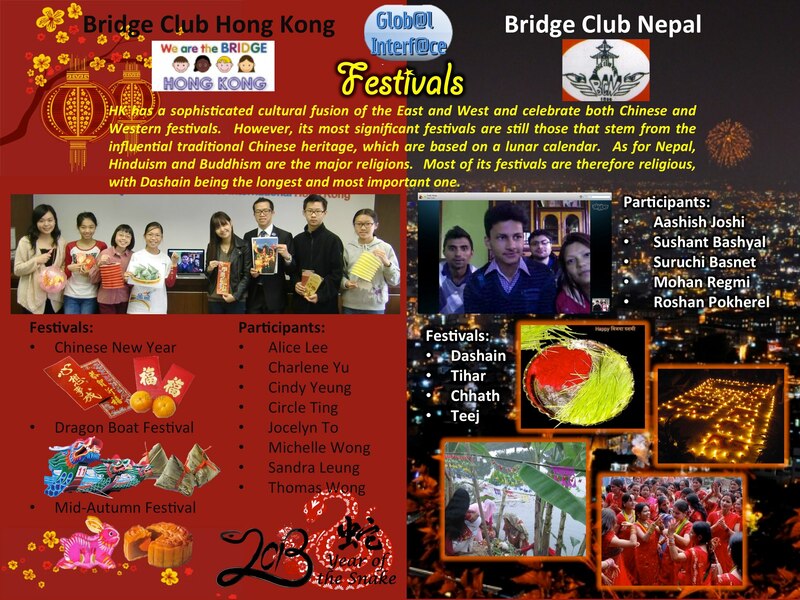 As a part of common activity, Bridge Club Nepal (BCN) and Bridge Club Hong Kong (BCHK) held a video-conference on 2013/02/16. 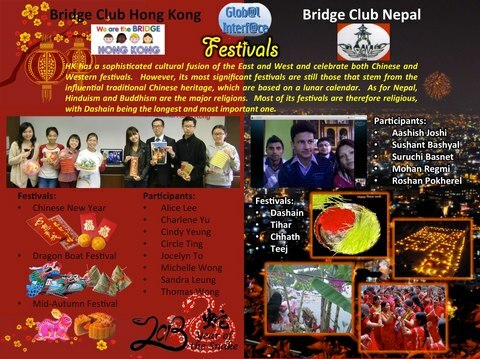 The theme for the activity was “Festivals”. Hinduism followed by Buddhism, constitute two major religion of Nepal and this makes Nepal rich in culture. Many notable festivals are celebrated here. Several of the festivals last from one day to several days. Dashain is the longest and the most important festival celebrated as "a day of Victory over Demons". Tihar is another important festival of Nepal. Other important festival includes Teej (fasting festival for Hindu women), Chhath (Dedicated to Sun God), Buddha Jayanti (the celebration of the birth of Buddha), Maha Shivaratri (a festival of Lord Shiva), Janai Purnima (Janai is ‘sacred thread’ and ‘purnima’ means ‘full moon’), Holi (festival of ‘colors’). As for Hong Kong, there is cultural fusion of the both east and west. They celebrate both Chinese and Western Festival. However, its most significant festivals are still influenced from traditional Chinese heritage and are based on a lunar calendar. Chinese New Year, Ching Ming Festival (cultural event revering one's ancestors), Tuen Ng (Dragon Boat) Festival, Mid-Autumn Festival, Chung Yeung (The Double Ninth) Festival, are among the mostly celebrated festival. It is the longest and the most auspicious festival in the Nepalese annual calendar, celebrated by Nepalese people of all castes throughout the globe. The festival falls around September–October, starting from the bright lunar fortnight and ending on the day of full moon. It is celebrated for 15 days; the most important days are 1st, 7th, 8th, 9th, and 10th. Day 10 Dashami- On this day, a mixture of rice, yogurt and vermilion is prepared by the women. This preparation is known as "tika". Elders put this tika and jamara which is sewn in the Ghatasthapana on the forehead of younger relatives to bless them with abundance in the upcoming years. The red also symbolizes the blood that ties the family together. Elders give "Dakshina", or a small amount of money, to younger relatives at this time along with the blessings. This continues to be observed for five days till the full moon dur­ing which period families and relatives visit each other to exchange gifts and greetings. This ritual of taking tika from all the elder relatives (even the distant relatives) helps in the renewal of the community ties greatly. This is one reason why the festival is celebrated with so much of vigor and enthusiasm.). The fifteen days of celebration occur during the bright lunar fortnight ending on the day of the full moon. Dasain is also popularly referred to as Durga Puja. Throughout the country the goddess Durga in all her manifestations is worshiped with innumerable pujas, abundant offerings and thousands of animal sacrifices for the ritual of holy bathing, drenching the goddess for days in blood. This festival is also known for its emphasis on the family gatherings, as well as on a renewal of community ties. People return from all parts of the world, as well as different parts of the country, to celebrate together. All government offices, educational institutions and other offices remain closed during the festival period. Tihar also known as Deepawali in terai region of Nepal is a five-day-long Hindu and Buddhist festival celebrated in Nepal which comes soon after Dashain. The five-day festival is considered to be of great importance as it shows reverence to not just the humans and the Gods, but also to the animals like crow, cow and dog, who maintain an intense relationship with the humans. The rituals of the festival are rigorous and are observed over a period of four days. They include holy bathing, fasting and abstaining from drinking water (Vratta), standing in water for long periods of time, and offering prashad (prayer offerings) and Aragh to the setting and rising sun. Chinese New Year is an important traditional Chinese holiday. Also known as the Spring Festival, Chinese New Year celebrations traditionally ran from Chinese New Year's Eve, the last day of the last month of the Chinese calendar, to the Lantern Festival on the 15th day of the first month, making the festival the longest in the Chinese calendar. Because the Chinese calendar is lunisolar, the Chinese New Year is often referred to as the "Lunar New Year". Regional customs and traditions concerning the celebration of the Chinese new year vary widely. Often, the evening preceding Chinese New Year's Day is an occasion for Chinese families to gather for the annual reunion dinner. It is also traditional for every family to thoroughly cleanse the house, in order to sweep away any ill fortune and to make way for good incoming luck. Windows and doors will be decorated with red colour paper-cuts and couplets with popular themes of "good fortune" or "happiness", "wealth", and "longevity." Other activities include lighting firecrackers and giving money in red paper envelopes. Duanwu Festival, also known as Dragon Boat Festival occurs on the 5th day of the 5th month of the Lunisolar Chinese calendar. The focus of the celebrations includes eating rice dumplings 'zongzi', drinking realgar wine ‘xionghuangjiu’, and racing dragon boats. Other common activities include hanging up icons of Zhong Kui (a mythic guardian figure), hanging mugwort and calamus, taking long walks, and wearing perfumed medicine bags. Other traditional activities include a game of making an egg stand at noon (this "game" is one that if you make the egg stand at exactly 12.00 noon you will have luck for the next year), and writing spells. All of these activities, together with the drinking of realgar wine, were regarded by the ancients as effective in preventing disease or evil and promoting health and well-being. We both BC participants learned about festivals of each other and had a great time. Thank you BC Hong Kong for the wonderful presentation.